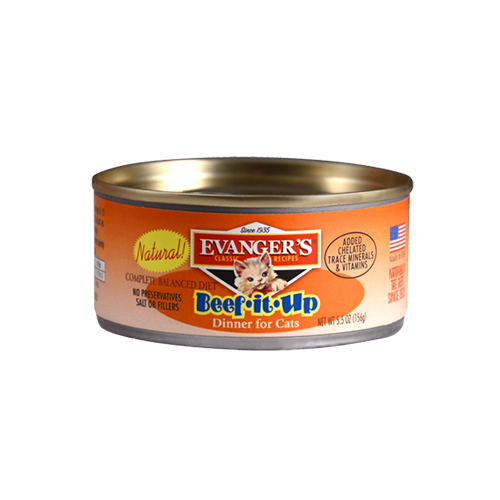 Beef it Up Dinner – Evanger's Dog & Cat Food Company, Inc.
Evanger's Beef It Up Dinner is formulated to meet the nutritional levels established by the AAFCO nutrient profiles for all life stages. Kittens, pregnant and nursing cats may require 2-3 times above amounts, and reduced for less active or older cats. Amount of food your cat requires depends on activity, age, environment and breed. A Classic combo for a classic dinner. Beef, Beef Broth, Butternut Squash, Tomato Paste, Chicken Liver, Guar Gum, Flaxseed, Potassium Chloride, Dicalcium Phosphate, Brewers Dried Yeast, Taurine, Vitamins (Vitamin E Supplement, Niacin Supplement, L-Ascorbyl-2-Polyphosphate [Source Of Vitamin C], Thiamine Mononitrate [Source Of Vitamin B1], Calcium Pantothenate, Vitamin A Supplement, Pyridoxine Hydrochloride [Source Of Vitamin B6], Riboflavin Supplement [Source Of Vitamin B2], Folic Acid, Vitamin B12 Supplement, Biotin, Vitamin D3 Supplement), Minerals (Zinc Sulfate, Iron Sulfate, Copper Sulfate, Manganese Sulfate, Sodium Selenite, Potassium Iodide). An average 8-10lb. cat will eat about 1 can daily. Adjust as needed for your cat's age & activity. Refrigerate unused portion. Provide clean, fresh water at all times. Kittens, pregnant and nursing cats may require 2-3 times above amounts; reduce for less active or older cats.